I recently got engaged and am super excited to start looking through wedding blogs, magazines, and pinterest boards. So I will apologize in advance for this and any future posts about weddings. OUI magazine is one of the first magazines I saw at the local presse stand. It looks very nice, has the standard serif font logo, the style stories are very well done and cohesive, and of course filled with advertisements from various wedding venders. After flipping through the magazine for a bit, I decided to go online and see if they and any online communities, blog posts, or social media presence. As soon as I see the landing page, I already regret looking it up online. How can this beautiful magazine have this as a website?? The first thing that appalls me is the color scheme. Really, neon green mixed with competing shades of pink? Every page looks the same too, with the same font and size. The website does not reflect the magazine I hold in my hands at all! Heck, even a free wordpress theme would look better than this pre-2000 website attempt. I am extremely disappointed by this magazine’s lack of brand extension. And worst, there is no social media presence! Not even a pinterest page for their French readers! There is so much this magazine can do, but with only four issues a year, maybe they just don’t care to go beyond what they already have. 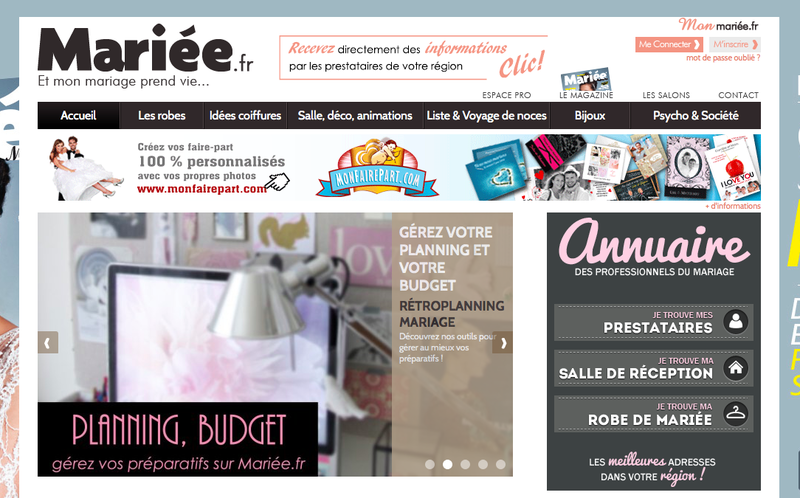 Mariée magazine has a younger audience feel than that of OUI. That could be because I actually see children in the stories and advertisements, also partly because the stories and wedding themes are actual themes I have seen floating around pinterest (mason jars and barns anyone?) and their logo is sans serif and thick which gives off a playful feel. Their website is much better than OUI’s, but my one complaint would be its too picture heavy. The background wrap with the cover (which doesn’t continue when scrolling which makes it an awkward size and placement), the banner ads, the sidebar ads, the in between posts ads and the pictures of archived posts! I know a picture is worth a thousand words, but come on, you are magazine, surely you do have something to say. Thankfully, they are on social media, Facebook and Pinterest (I had to find the Pinterest on my own, not linked to their site). The website does have some great tools to help you search for wedding dresses and reception centers, plus their themes were right on point with whats been trending. I would like to see me more information and not just pictures tho, even within the posts themselves. This magazine claims to be for the best and for the chic. The stories, suggestions, and fashion spreads follow suit with their motto. Personally, the chic cover made me pick it up in the first place. After glancing it over, the magazine looks like a good combination of the youthfulness of Mariée and the sophistication of OUI. I found that I actually liked this magazine over the others. Their website is actually good. Still has a lot of visuals, but at least I am guided through them unlike Mariée. The focus of the website is not about the magazine, but about marriage itself; the dresses, invitations, accessories, etc. There are direct links to all their social media at the bottom of the site as well. PS: if you want to follow my wedding journey, feel free to follow my wedding website!